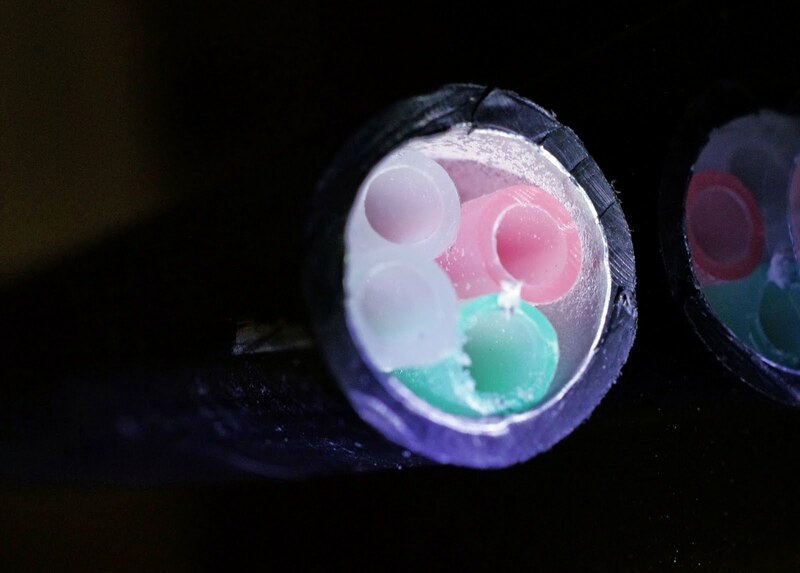 Installing optical fibre can be a costly and difficult process. One relatively recent option to ease the task is known as air-blown fibre. 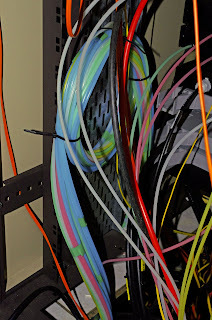 Rather than installing expensive fibre, one installs tubes, which look like straws that are often bundled together. Fibre is then blown through these tubes as required. The tubes may be installed over hundreds of meters - even a few kilometers. And fibre can be blown through the tubes at tens to hundreds of meters per second. Initially more tubes can be installed than required and fibre could be blown through them when required. And an obsolete fibre can be removed and replaced with a new one. 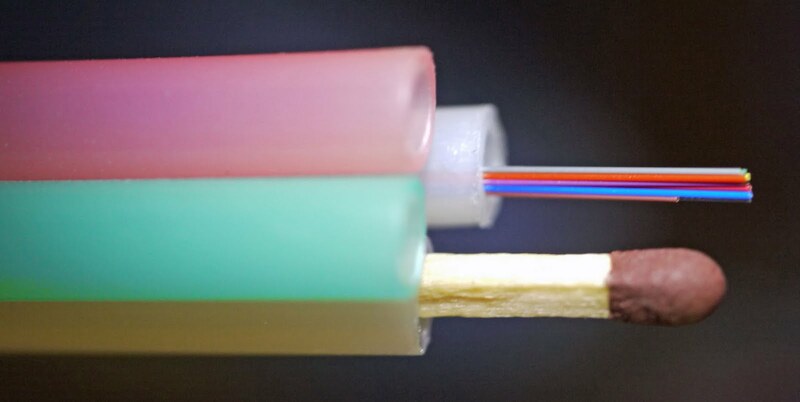 The next picture shows a fibre in one of the tubes. 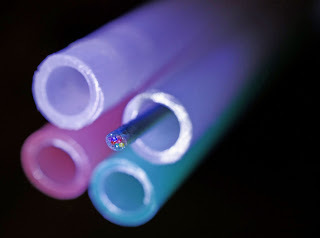 When one shines a light through the fibre it becomes clear that it actually consists of several fibres (or cores). The next picture contains the same fibre as above, but this time lighted from the other end. Of course we need an image with a matchstick in it for a sense of scale. 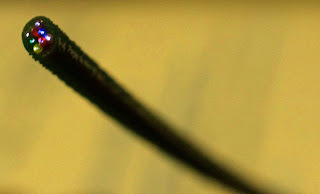 The following picture not only includes the matchstick, but also shows the fibre above with its outer coating stripped away. 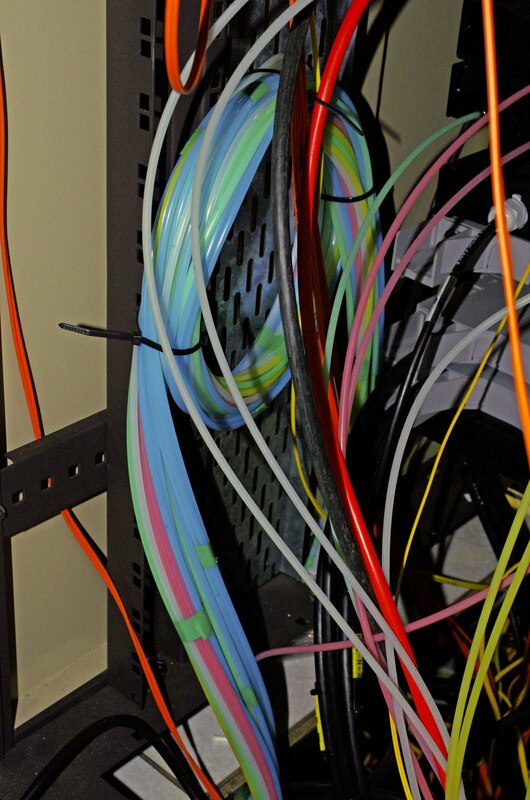 To take matters to the real world, the next picture was taken at the place in a network room where all the various parts of some big network come together. Various pieces of optical fibre are visible. In particular, note the microtubes (making loops!) through which fibre has been blown to other buildings.